Do you still think the Pope is Catholic? Of course PF isn't Catholic. None of them are. They usurped the Throne of Peter through demonic treachery to enforce the NWO totalitarian godless society upon everyone. What's so appalling is that the vast majority of the prelature is quietly supporting this 'papacy' to overthrow the OHC&A Church. This is what comes from wilful disobedience to Our Lady's request to have Russia consecrated to Her Immaculate Heart & to unveil the Third Secret of Fatima in 1960. Even at this late hour Her demands can be, & must be, met but unfortunately we don't hear any clamour from men wearing red & pink hats - only one or two here & there who have now become very quiet indeed. The apathy is mind-boggling & must surely be Satanic. When the abuse scandal reaches astronomic proportions Burke and Schneider will be of the few spared by the raging fire, thanks to their separation from those in the abuse machine. The Pope was to consecrate Russia to the Immaculate Heart of Mary ,in Union with the Bishops of the world ,would the Bishops of the world obey the Pope ,During the papacy of Pope Pius X11 ,one reads of open rebellion against his orders in the Vatican and elsewhere .When St John Paul 11 made the consecration of Russia ,was he in Union with the Bishops of the world. ?.In the vision the children saw ,why was the term used of a Bishop dressed in white ,why not the Pope or Holy Father, what is the symbolism of the Cross made of cork ? Holy Mother of God, please bless and protect your faithful clerics, religious and laity from harm. We have hit a new low, even for PF. The Vatican is a Socialist state! I think the Pope is Catholic because he has to be. That is why we say, “Is the Pope Catholic?” That is sarcasm for a reason. Jorge isn’t Catholic, so he isn’t the Pope. AND he is a real bad guy with the power of OUR Vatican influence and wealth. Get him out. He’ll wreck the whole world and so will whoever they stick in next. The Vatican must be removed from the hands of this Satanic coven. Or we just wait for the damned Antichrist. Must we just sit here awaiting the Antichrist? This is all you traditionalists fault. Why, why did you slink off to your own personal little chapels? Oh, we’ll just ignore the bad men. Ignore?! Catholics, how about obedience? You have to obey the Pope so if you can NOT then he is a fake, a fraud, a phony, a hoax. You just hide from that?! You should have addressed this for what it was from the beginning, a massive fraud. It was never a bad council, it was a scam by imposters. I’m so mad we’ve come to this. How are we going to get a Pope now? Darn it. "Of course PF isn't Catholic. None of them are." And the hand wringing bishops will just quietly keep quivering in the corners wondering "who will do something?" while the Church becomes something other than THE Church... and we're supposed to be reassured that everything a-okay! I expect married lesbian priestesses at any moment as my pastor. Dear Melanie, What is happening is God's Will. It is the "Operation of Error" St. Paul warned us about. God is permitting it to sort the wheat from the chaff - the believers from the unbelievers. Our Lady has warned us about it repeatedly. Nothing to fear. God is in control. We know that the Immaculate Heart will triumph and that the Catholic Church of Christ will be restored to all her glory. In the meantime - patience, daily Rosary, virtual Mass with DVD, or live webcast, faithful observance of the Catholic Faith and anathema to NWO "clerics" and "church." Friends, we don't have a lot of power here. We can pray about it and ask God to intervene. What we can also do is inform fellow Catholics, and withhold financial support. Now this has caused us some discomfort, it's actually very hard to stop giving! But when we financially support our church, at least a portion of that is going to the diocese, and some of that goes to Rome. So here is the way around it. Give gift cards. Get gift cards for whatever your priest might use, gas cards are a safe bet. But it can be food cards from your local grocery, gift cards from a department store, anything like that. Will your church like it? No they will not. But it is support, and it is a valid means of support. We have little, but we should use what we have. Personally I do not want to help Francis-Church one iota. Destroy the church on your own dime. Pope Catholic in name only, but in practice a Communist dictator. Catholic? Not a chance in Hades. Pray for faithful clergy. Kathleen, I must disagree. Why give the NO priests anything? There is no such thing as a holy or decent priest who supports the Novus Ordo and Vatican 2. And any money in gift cards you give the guy just frees up other money to the bishop. If you have not totally cut yourself off from all things V2 and NO, its time to do so. They are a false sect teaching a false religion. Why would anyone associate themselves with their heresies? I actually welcome this news. These two "friends of tradition" are nothing more than sheep in wolves clothing. They dress up fancy and go through the motions of saying the Latin Mass, but at the end of the day they still prop up the phony V2 NO heresies. Question: Is the Pope Catholic? Simple question. Doesn't need a conclave to decide that one. Then act accordingly. No! Francis is NOT Catholic. And he is not a valid pope, either. Of course, a non-Catholic cannot be a valid pope. Additionally, Francis' election was invalid due to prohibited canvassing for conclave votes. And Pope Benedict XVI's resignation was not valid, because it was coerced. Hey, Burke and co. have shown they can be push-overs. Once you show them that you can be bullied, then they will only increase it and further isolate them. Either that, or hopefully for their sakes it's because Francis has caught wind that they are seeking to confront him with others and gain allies for a council on their little trips. But I have a hard believing that. Because if it were true, then I'd expect resistance from Burke and Schneider. If Mccarrick can blatantly disobey Pope Benedict, then it would be a no-brainer to disobey one whose "Papacy" is questionable at best. And if they are supposedly seeking to upend him, then all the more reason to ignore him, especially when it's 'unofficially' verbally implied by the Mouth of Sauron known as the Secretary of State. And if they want to circumvent it while maintaining 'obedience' then let Schneider know that this thing call the internet and teleconferencing exists. Bergolio and Co cannot ever silence our Lords true apostles. These fairy Matrinish clowns continue to dance with the devil, endeavoring to silence Holy Men. Do they not know it is all in vain- do they not know our lord will not be mocked, are they that blind that they cannot see God’s almighty hand blocking Bergolio’s path towards destruction of our lord’s mystical body? Let them open their eyes and computers, let them navigate to Life Site News web page and there they will see God’s almighty hand working through his true disciples. They don’t even have to use their mouse to scroll down to see that God’s almighty will, will be done on earth, not that of Jorge McCarrickish and his clowns. I think you mean "...there is pressure..."
Thank you, Father Editor! I missed that. Good to see you back here too. I am commenting mainly on Crisis Magazine and The Catholic Thing. These are conservative Catholic but not traditional. When I criticism Vatican II--which is often--the guns start blazing at me. Most of these conservatives have no idea what the Modernist foundational aspects of the current crisis in the Church. Making comments on these sites is a sort of mission with me but progress is very very slow. Most Catholics think Vatican II was a good thing while it was actually a catastrophe. Hope you are doing well Peter. I continue to give to Holy Trinity Seminary. I’m wondering if I’m allowed to say that the Remnant are the most pusillanimous sack of useless quisling worms to have ever graced this planet. These people would sell their mother’s soul to avoid just war. You boys, don’t get up. Please, just stay comfy on your sedevacation and let the men take care of things. Mice. Tom A., I'm glad for the feedback, thanks. It's good to get another opinion. This is a dilemma. We're all used to supporting the church, and yet we know if we continue we are only assisting the evil to continue. We can't make these men follow Catholicism. Even if we could compel them to follow it in appearances, it won't be the same thing, we need holy priests, not actors. I suppose I'm hoping to at least keep the buildings going and the Holy Mass. We attend the Extraordinary Form Mass, said by a diocesan priest. We're grateful for it, we know it won't last forever. There are not many of us, maybe 40 at each Mass. We feel obligated to provide some support so we can keep the Mass. We know they'll yank it if it doesn't at least support itself. I wouldn't give one dime to NO Church. But this...I don't know. We want to support the priest, not the diocese. This seems like a way to do that. There are no perfect answers. Someday we feel it's going to be a moot point. This church is going to starve itself to death by the things they do. The church seems too wealthy for it's own good, the money has helped them corrupt the faith and leads to where we are. We need a poor church that meets in people's homes. Then at least we won't have men going into it as a way to travel and meet fellow homosexuals for parties on the money Catholics have labored to give them for the church. Michael Dowd, good for you. Too many Catholics are asleep. I've been around for awhile and I've read more than a few books in my time. A dear Archamandrite ( Catholic) and former Jesuit with whom I was close who knew I also knew Malachi Martin and personally he did not care for him , told me to read his book nonetheless ," The Jesuits", because he said Martin was absolutely correct on everything he said in the book about the Order.........Yes the Jesuits used Soviet Marxist curriculum in all their Parochial S American schools ,which they ordered from, and purchased from, Communist Cuba. ...........How could these alleged Catholics believe in anything else after being propagandized from their youth? ONLY if they had right thinking parents who taught them the truth. Which in case no one has paid attention, is exactly why Fr Peter Stravinskas is against home schooling Catholic parents. I was there at one time too. The thought that the TLM was sharing the same space as the blasphemous NO fake mass became to great for me to pray in peace. I had to get away from anything to do with the NO. That article basically advocates heresy and schism. They teach their audience that one can totally ignore the teachings of a Pope. Johnno, you and I have had our combox squabbles before over many issues. I just want to ask you a question about Burke and Schneider. Does it bother you that they also support the NO mass, V2, the 1983 Code of Canon Law, and JP II's New Cathecism? Popes are always Catholic by definition. It is Bergolio who is not Catholic. I think the certification is a great idea. 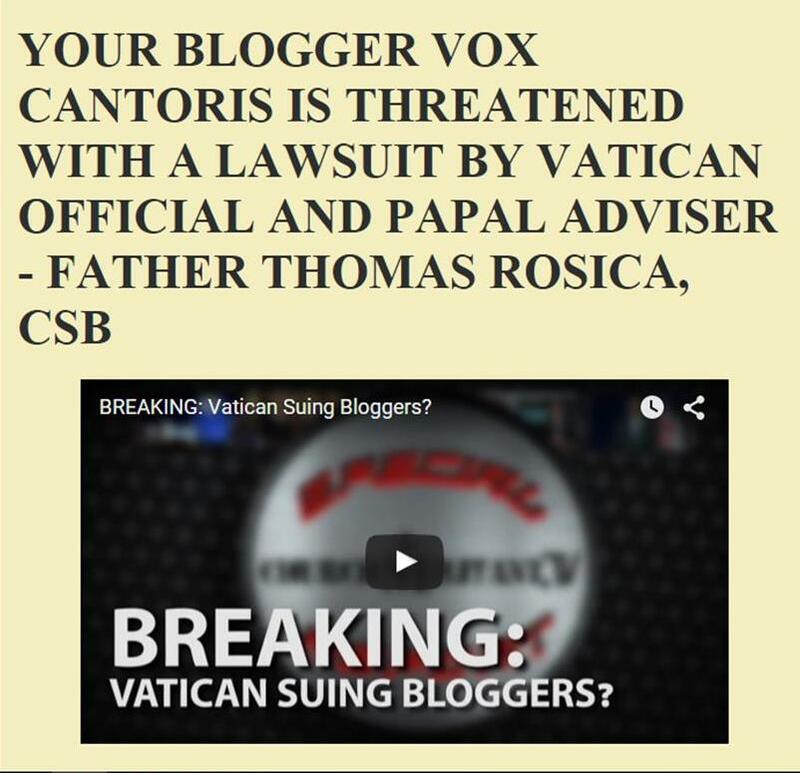 They can't ban an un-certified website, and Catholics will know to avoid the "certified" ones. In person meetings are hard to document. Internet and teleconferencing is easier to spy on. @Paul Morphy, the time for words has long passed. The time for action is now. Boycott this papacy. Boycott your bishop who supports this papacy. Tell your bishop explicitly that he now needs to make a choice. It is that simple. Until he makes the correct choice financially boycott the church informing them of your decision and the reasons for your decision. Well, the basic Catholic doctrine that a public heretic suffers automatic excommunication from the Church in terms of Divine Law; Is no longer a Catholic and cannot be Pope is daily gaining wider acceptance. Thanks be to God.